As Michigan’s 2017-18 Teacher of the Year, I’d like to say thanks for taking a minute to read during your busy schedule. I know for most of us, school has just started, and that means our days can be hectic, rewarding and dynamic. At the beginning of every school year, I write out goals for the year on a notecard, and then I reference it several times throughout the year to reflect. This year’s notecard has some really exciting and ambitious goals. 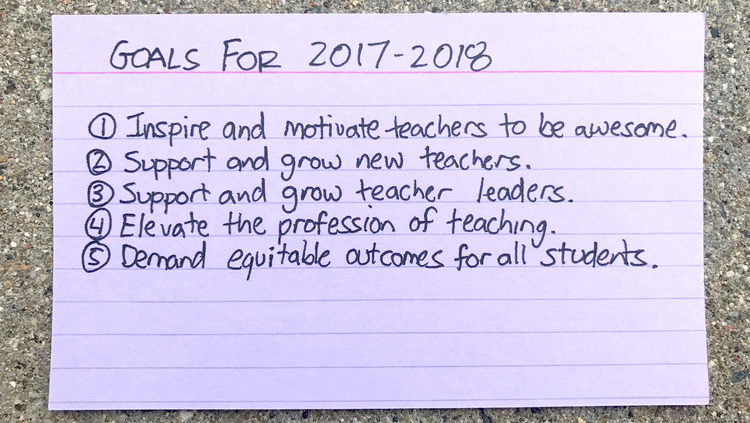 These are goals that I’ve been working to accomplish for some time, but now have the opportunity to more fully realize because of this unique and pivotal MTOY position. This summer has provided huge opportunities to reach these goals. I gave a keynote speech in the district I grew up in, worked with teachers at an international school in Nicaragua and advocated for “Access for All” with AP Stats teachers in Wisconsin, Georgia, Colorado and California. I’ve been grateful to work with teachers these past three months, especially with the new perspective of being MTOY. This crazy summer schedule has given me an excuse to do very little writing. I’ve internalized this idea that I am a “math” person and could never be a great writer, and this makes it hard to get excited about writing. But I also realize the potential for greater impact on teachers and students if I am able to take my teaching experiences and turn them into a thoughtful, organized set of written ideas. And so, I am taking my growth mindset forward with the overarching goal of committing to writing more. I know that the only way that I will improve is with deliberate practice. (Have you talked to your students about this one?) My sister-in-law has agreed to be my writing coach, and we’ve developed a structure where she will provide me with feedback as I write each blog post. If you haven’t already, please consider adding yourself to the subscriber list, so that you will get an email update for each new post. I look forward to the challenge of writing more and the challenge of the MTOY journey ahead. I will continue to work hard to positively represent this profession that we care so much about and to share the amazing stories of students, teachers, and schools across the state of Michigan. I hope to continue to inspire and motivate teachers towards helping our students find success.